True crime meets real world in this epic Pathography. The free world has been waiting on a book like Carrots In A Cage for decades. Jeremy Lee tells a great story but this one is real and touches us all. This book is not just about convicts and the jailers, judges and cops and prosecutors. You will read about the jungle, the zoo and the zookeeper too. Our criminal justice systems creation, purpose, and direction are intellectually examined by the authors own life experiences and immersion in the very belly of the beast. He has experienced the hell of gladiators school institutions, taken on FBI agents and prosecutors and assisted attorneys in securing not guilty verdicts for innocent Americans. This author has risen from blood stained cells that smelled like barns stalls to building houses for charity with the Indiana DOC and the Indianapolis police department. 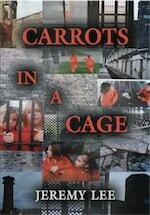 Educated on the streets and libraries of the tough world of the abused Jeremy Lee finishes Carrots In A Cage with a refreshing look at a solution to our countries problems that doesn’t involve locking up everyone below the poverty line. Fighting Blind is about the battles we all fight. Jeremy Lee has a style that is clear and crisp, entertaining and heart touching. This author from middle town America, reaches into his characters lives and makes the reader feel like they are in the story. Here is a refreshing style that promises to make you want more.